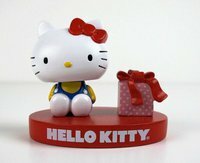 HELLO KITTY su Facebook, pagine Italia e pagine straniere. 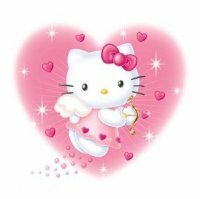 Lista di tutte le pagine Fan, tutti i gruppi di Hello Kitty, la tenera gattina di propriet� del marchio Sanrio, presenti sul famoso social network. CLICCA SULL'IMMAGINE O SUL LINK E VAI ALLA PAGINA FACEBOOK! Hello Kitty's Official Fan Page! Hello Kitty lives in the suburbs of London with her parents and her twin sister Mimmy. She has lots of friends at school with whom she shares many adventures. Her trademark is her red bow that she always wears over her left ear. Hello Kitty is as heavy as three apples and as tall as five apples. Traveling, listening to music, reading, eating yummy cookies, and making new friends. As Hello Kitty always says, �You can never have too many friends!" She collects small, cute objects like ribbons, hair accessories, candy, stars, and goldfish. Ecco la pagina Facebook italiana di Hello Kitty, una pagina Fan piena e zeppa di prodotti e accessori Hello Kitty in vendita online sul sito associato. Puoi trovare di tutto, dagli accessori bagno ai pupazzi Hello Kitty.